Basic Issues in Rehabilitation of the Brain Damaged Definitions Because of the vagueness surrounding the term brain damage, it is nec- essary at the outset to define the population to which this book may have some application. Although it is usual to speak of the brain- damaged patient in a general way, the conditions referred to cover a variety of specific disorders. 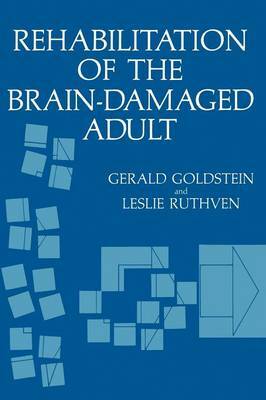 In this book we will be discussing only individuals who become brain-damaged as adults. We will be ad- dressing ourselves specifically to adults who have sustained demon- strable, structural brain damage. Those conditions in which brain dys- function is a possible etiological agent, such as a number of functional psychiatric disorders, will not be considered. Thus the entire topic of mental retardation and early life brain damage will not be treated here, nor the many problems associated with minimal brain damage syn- dromes in school age children. Modern psychiatric thinking has tended to blur the distinction between the so-called functional and organic disorders (d. Shagass, Gershon, & Friedhoff, 1977), but we would ad- here to the view that the patient with structural brain damage contin- ues to present relatively unique assessment and treatment problems. Furthermore, the emphasis of this book will be placed on individ- uals with nonprogressive, chronic brain damage.